Are you a coach looking for professional learning opportunities? Want to learn more about math coaching and expand your professional learning network? 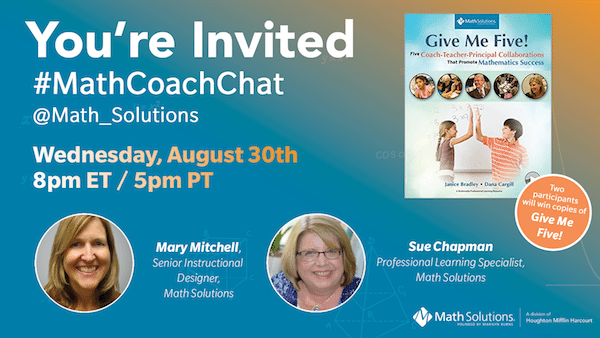 Join @Math_Solutions for our first #MathCoachChat on Wednesday, August 30th at 8pm ET/ 5pm PT. Mary Mitchell, Senior Instructional Designer, and Sue Chapman, Professional Learning Specialist will lead a discussion on Questioning with a Purpose in Coaching. Two lucky participants will be randomly selected to receive copies of Janice Bradley and Dana Cargill’s Give Me Five:Five Coach-Teacher-Principal Collaborations That Promote Mathematics Success. Join us for a lively discussion on coaching techniques and strategies! We hope to chat with you!